Published: July 5, 2016 at 09:27 p.m. Updated: April 5, 2018 at 07:33 p.m.
Who will be starting under center for the Denver Broncos come September? 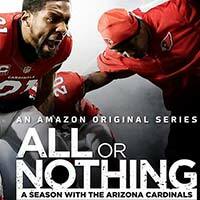 Stream the Amazon Original Series "All or Nothing: A Season with the Arizona Cardinals" on Prime Video. Broncos safety T.J. Ward joined NFL Network's Total Access Tuesday and provided some insight on his team's ongoing quarterback competition between Mark Sanchez, Trevor Siemian and Paxton Lynch. To Ward, the battle between all three quarterbacks is "even." "We got three guys working really hard," Ward said. "They've all worked with the 1's, 2's and 3's. We have seen them work with different receivers in the starting offense and second-string offense. I'm not sure (who will start in September). ... Sometimes you really have to see who threw the ball or who is starting with the 1's because they're pretty even." Siemian has one season under his belt, making just one on-field appearance in the team's Week 15 loss to Pittsburgh. Lynch enters the competition as the Broncos' 2016 first-round draft pick. If either young signal-caller wins the starting nod, Ward said the defense would be able to support and alleviate at least some of the pressure off of the novice quarterback. "You never know. He might come in and have a year like Ben Roethlisberger and take us to the Super Bowl again," he said. "Mark (Sanchez) definitely commands that he has that veteran presence. ... You definitely see that, and it stands above the other two guys, but Paxton (Lynch) comes in for his first throw and it was like 'oh, okay that's an NFL quarterback right there.' (Lynch) definitely can let that thing go. Trevor (Siemian) has been here for two years and it's going to be tough coming from his position with a first-round draft pick and a veteran in front of him but he looks well, as well."